1. Slide your phone into the battery case and make it connect to the charging port properly. 2. Put the uper part of the phone into the soft frame of the battery case. 1. Lift the top of your phone slightly from the battery case. 2. Use your thumb to push your phone through the camera hole of the battery case. Designed for Iphone X,Make your phone special style. Cell Capacity:Original Polymer Lithium battery,power your phone stand by extend. Creative Design,Enjoy your phone without removing the power case. High class material to protect your phone.Charging and protecting 2 i n 1. Integrated circuit design,effectively avoid shorting circuit or over charge even under extre me conditions of wrong operating. With smart switching and precise power display,to extend the life of the built-inbattery. Connect the Lightning to USB cable with the power case,then plug the USB to power adapter to charging the power case,when charging,the LED indicators are flashing. Put the phone into the power case,press the switch key to charge,When charging,the LED indicators are flashing,press again the switch key to stop charge. Enjoy Music,Calling-(NOTE: please charge the battery case first before you use it to charge your iphone. )This iPhone X battery case is compatible with iphone Lighting Headphone,which enable you to listen to music or make a phone call through the case while charging your iphone! 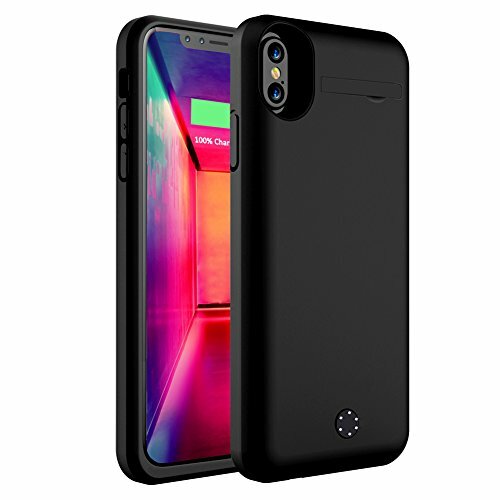 More Than 200% Extra Power--ZTESY battery case with powerful 5000mAh capacity for iPhone X helps keep your phone charged the entire day. 100% compatible with all iOS versions--Approved by Apple to work with all functions of your iPhone X charging case. This battery case has the highest industry regulatory certificates: CE, RoHS, and FCC. 360°scratch-guard--ZTESY High quality battery cases with dual layer to protect your iPhone 8 / 7 / 6S / 6 from scratches and daily wear and tear.LED indicator will show how much juice is left. 30-DAY MONEY-BACK GUARANTEE--Purchase with confidence! Life-Time ironclad warranty ensures you are protected for the life of this product, enabling you to return the product in case you don't like your purchase for any reason. If you have any questions about this product by ZTESY, contact us by completing and submitting the form below. If you are looking for a specif part number, please include it with your message.